Today I bring you the perfect Indie summer pair. The True Bias Ogden and the Megan Nielsen Flint. Two patterns that you can’t escape in the Indie sewing world. I’m probably the last person on earth to make the Ogden. Everyone seems to have made it and is raving about it. To be honest when the pattern came out I wasn’t that tempted to buy it. 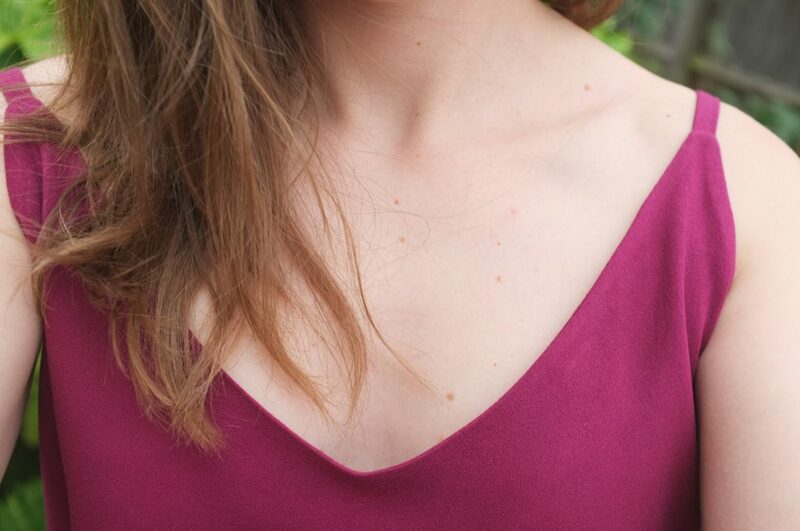 While I do appreciate a good cami, I wasn’t completely sold by the deep v in the back and overall it seemed to be too simple a pattern to spend my money on it. However, when Indiesew released their 2017 Spring/Summer collection, I bought the full bundle. Mainly for the Hampton Jean Jacket and the Highlands Wrap Dress but I was also quite excited to see what all the fuss around the Ogden was about. I decided to make a first version of the Ogden with some viscose crepe from Ditto Fabrics. I’ve been looking for viscose crepe since someone had mentioned online that it was one of their favourite fabrics (I can’t remember who though). Ditto fabrics stock this crepe in a couple of different colours but for some reason I went with this magenta, which is a colour I don’t often wear. When it arrived I was really impressed by the nice texture and drape of the fabric. The fabric does wrinkle quite easily but also straightens out when it’s hanging freely. My original plan for the fabric was the Highlands Wrap Dress; however, the colour is quite loud so I wasn’t sure if I would like it as a full dress. So I decided to make a Ogden instead, to see if I even enjoyed wearing this colour (disclaimer: I do!). Next up the Flint. 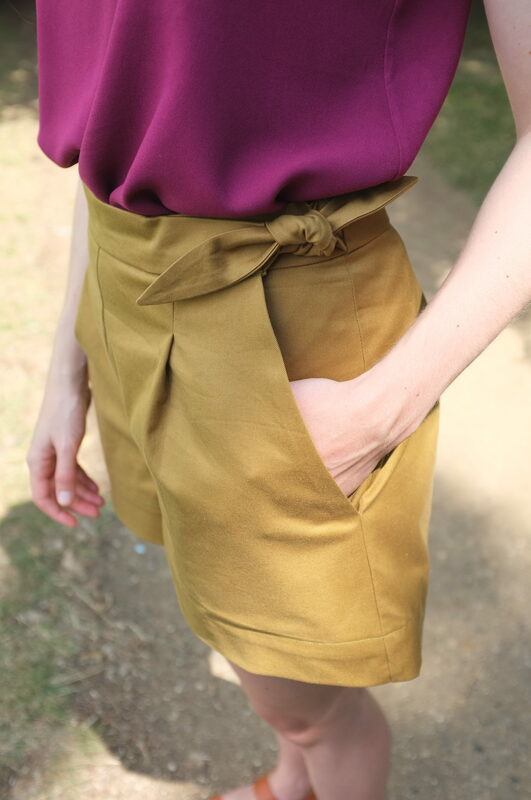 While I’m still not sure about the whole culottes trend I had the pattern on my radar, in particular because of the interesting cross-over closure hidden in the pocket and the cute little ties. Since I didn’t have a specific project in mind; however, I just made a mental note and didn’t buy it straight away. Then the other day, when I was fabric shopping in Abingdon at Masons with the lovely Lamorna, I came across this mustard cotton twill and thought of the Flint. I very much prefer a paper pattern over pdf (too much cutting and taping!) and bought the pattern from Fabric Godmother (actually the only place in the UK that had it, in all the other shops it was either out of stock or arriving soon). I cut a size M, which according to the measurements was slightly too wide at the waist and too tight at the hip but I figured, the darts and pleats at the waist would allow for an easy taking in, and the cut of the leg was very wide already, so a couple of centimetres difference would not be an issue. In the end I had to indeed take the waist in by roughly 3 cm (through the back darts and the back centre seam). The legs on the other hand were actually super wide and I slightly took them in through the crotch seam to avoid weird fabric pooling between the legs. I also shortened the shorts at the hem by 3 cm to look a little bit less like I was going on safari (not sure if I succeeded there…). Shortening the hem meant that the bottom of the pockets were caught in the hem, which actually helps the pockets sitting forward when putting the shorts on. 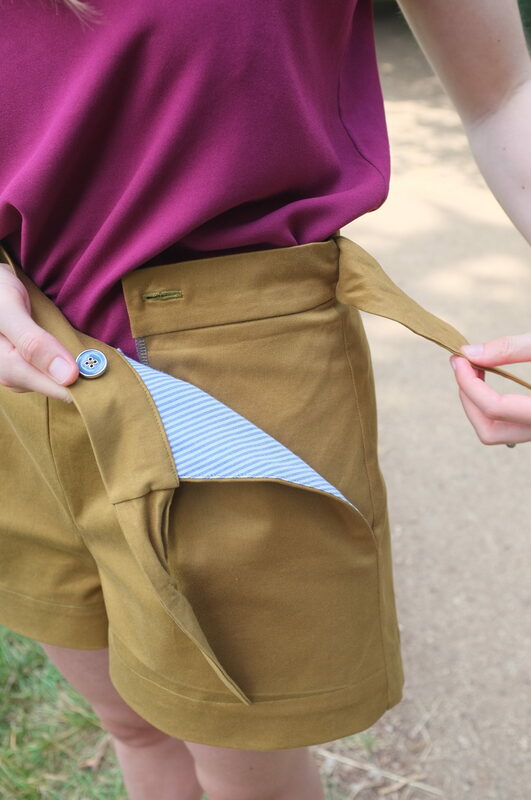 The most exciting part of these shorts are of course the vintage inspired opening in the pockets. 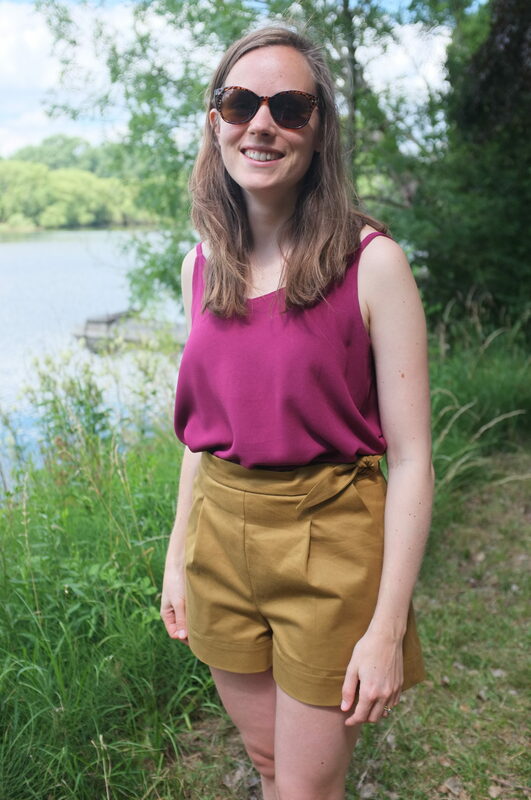 I like the clean look of high waisted shorts without a front fly, but I’m not a massive fan of side or back zippers. So this solution is genius! So neat! I lined the pockets with this cute blue and white striped cotton which in my opinion goes perfectly with the mustard fabric. 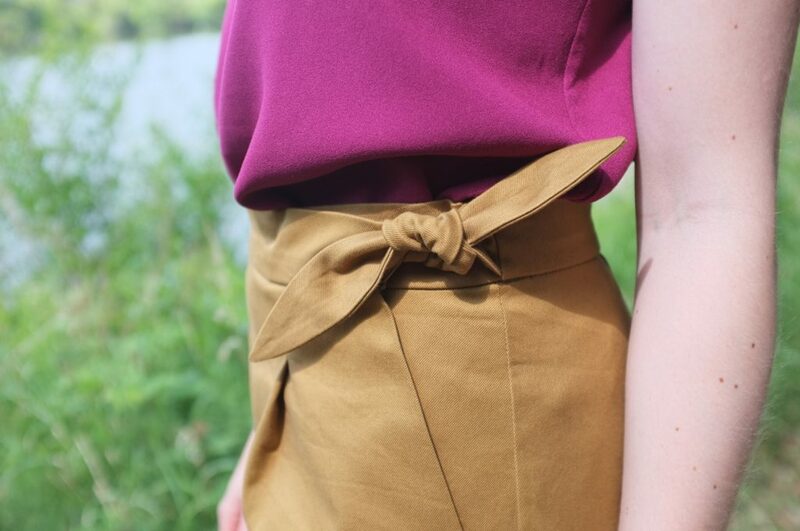 In addition to the ties, the shorts are closed with a hidden button. I did debate whether to do the ties or the closure only with buttons, the latter being a bit more practical if I want to wear a top over the shorts. In the end the cuteness of the ties won (they were one of the features that attracted me to the pattern after all). So how do I like the final shorts? I think overall they are really cute. This pattern has some really lovely details. I’m not 100% happy with the fit though. This medium weight twill is not very forgiving (in a more drapey fabric these issues might not show up at all). Around the backside the shorts could be a little bit snugger, just to avoid some weird folds of excess fabric at the centre seam. At the front the combination of the waistband not being snug enough (and the shorts riding down a little bit) and the release tucks at the front result in some poofiness. For a next iteration I might turn the tucks into darts to avoid some of that. Overall they are really wearable though and even got husband approval. So all in all, I can really understand why everyone is going crazy over these two patterns. Both are quite simple and quick makes with super thorough instructions. The result are some great wardrobe basics which pair super well together. I actually love both looks the top tucked in or loose. This colour combination is actually something completely new to me, both not my usual colours but I really like them, individually and together. I already put this outfit to the test at a summer barbecue on the hot weekend that we just had. The perfect pair!